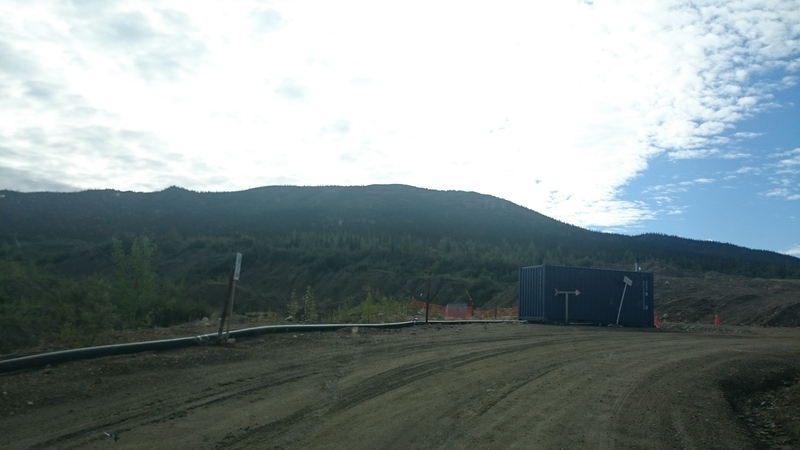 Our final site visit in this whirlwind tour of the Yukon was to the most advanced and fully permitted development stage project in the Territory, Victoria Gold’s (TSX.V : VIT) Eagle Project, which is well supported by both Government and First Nations. The Eagle project has completed a Feasibility Study and finalized an Environmental Assessment. Just as important, VIT has received the quartz mining license and construction license necessary to proceed with building the mine. 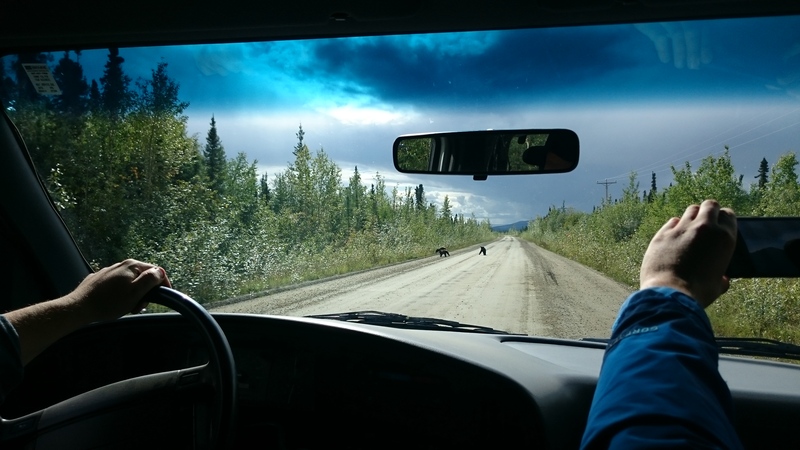 The Eagle Gold Project is situated on the Traditional Territory of the Na-Cho Nyak Dun (NND) First Nation. In 2011 a Comprehensive Cooperation Benefits Agreement (CCBA) was signed between the two parties providing transparency around the responsible and environmentally conscious advancement of the Eagle project. It also details employment, business opportunities, and a scholarship program for the NND First Nation. We drove the 85 km road from Mayo which was partially paved highway and forest service roads. 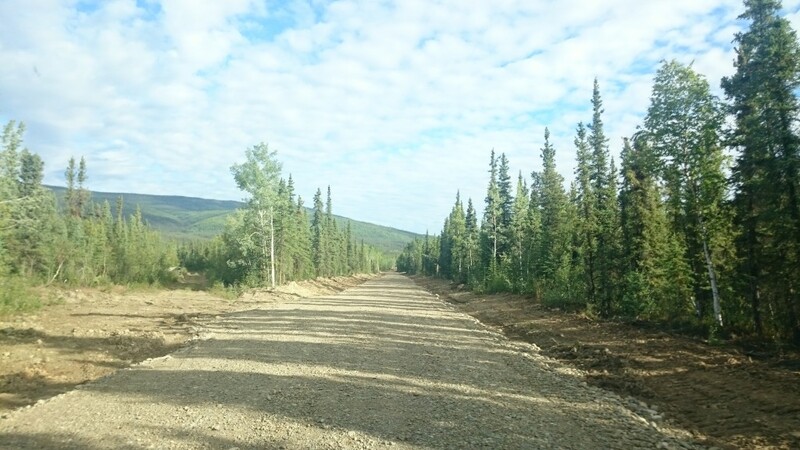 The infrastructure for the project is solid: there is year round access by all-weather roads to and on the project, the project is near the Yukon electric grid to tap into power, and there is an existing 100 person camp already on site that will be expanded prior to construction of the Eagle project. In the May 2015 re-issued feasibility study done by Tetra Tech it was noted initial construction and pre-stripping costs are estimated at $400M. Construction of the mine will take approximately 18 months. 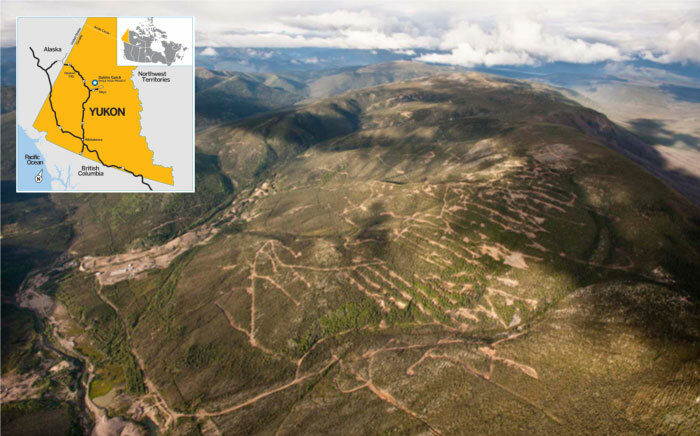 During operations the mine will be a significant economic contributor to the Yukon employing up to 400 individuals. The throughput of the mine will be 29,000 TPD (tonnes per day) equating to 10.4Mt/yr. Production will be 212,000 Oz Au/yr and 1.7M Oz Au for LOM at an AISC of $729/Oz. The economics show after-tax NPV of $227 and IRR 18% with payback of 3 years at $1325/Oz Au. Mr. Mcconnell, President & CEO, of Victoria Gold discussed the financing options and noted they are reviewing multiple possibilities. The company may use a traditional debt financing from a syndicate of banks or look to complete a portion through a royalty or streaming deal. Mcconnell confirmed he would not raise capital through equity at such low prices as Victoria is currently experiencing. There is also the possibility of a joint venture with majors in North America, China, or Japan. As of the date of our visit, 12 confidentiality agreements have been signed. The Eagle gold resource runs in an east-west direction for 1050 metres and to a depth of 500 metres. The reserve is 2.3M Oz Au (P&P, 91.6 Mt @ 0.78 g/t Au). The resource is 4.8M Oz Au (Ind., 222 Mt @ 0.68 g/t Au) and 1.5M Oz Au (Inf., 78 Mt @ 0.59 g/t Au). The mineralization is still open at depth and along strike noting room for growth in reserves and resources. 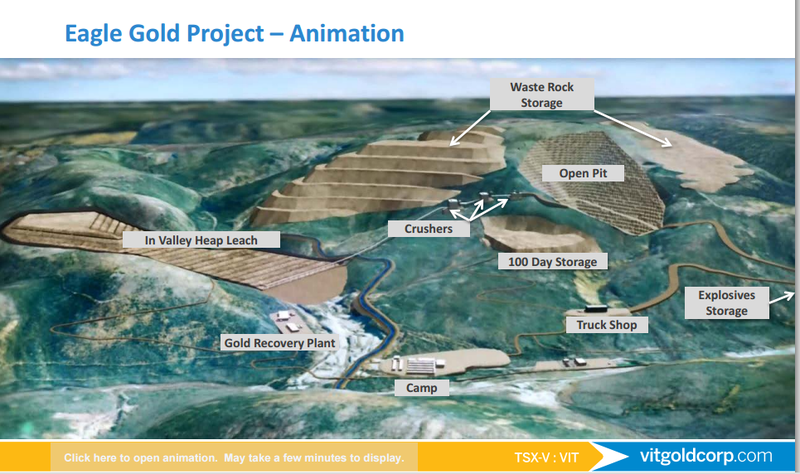 When in production the Eagle gold mine will be a conventional low cost open pit mine with a 3 stage crush, in-valley heap leach along with a gold recovery plant with a 10 year mine life. When fully built the open pit will be nearly 1.46Km long, 0.78Km wide and 0.56Km deep. When blasting the open pit, waste rock will be hauled to a waste rock storage facility. The mine has a 1.45:1 strip ratio which is favourable. The gold bearing ore will be taken to the 3 stage crushing circuit to go through the primary crusher, secondary crusher, and tertiary crusher. This will reduce the ore down to 7mm rubble ready to be heap leached. Mobile stackers will stack the ore in 10metre lifts in the in-valley heap leach pad. Solution emitters are installed 1 metre below the surface to protect the lines from frost. As the heap leach pad will be on a downward sloping valley, gravity will draw the leaching solution downwards which will absorb the gold from the ore. The pregnant gold solution is then pumped to the gold recovery plant where it is separated and prepared for smelting where gold dore is produced. According to the May 31, 2015 financials the company has $14.12M in cash and a positive working capital of $10.54M. Management noted they spend approximately $2.4M/yr on general and administrative expenses. As of August 18, 2015 directors and officers of Victoria owned in aggregate 3,868,223 or approximately 1.1% of the outstanding shares. Notable shareholders are Sun Valley Gold owning 48,265,570 shares or 14.2%, and Kinross Gold owning 55,886,628 shares or 16.4%. Exploration in 2015 is budgeted at approximately $3.5M. The remaining cash could last up to 3 years until market conditions improve without performing any further financings. 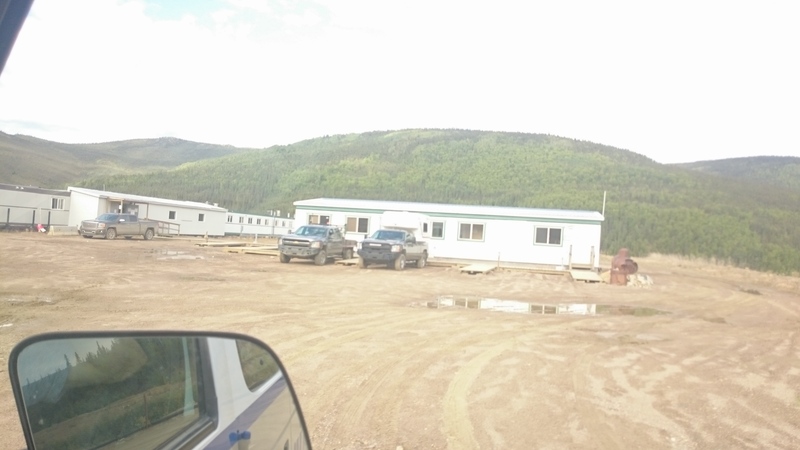 Overall, Victoria’s Eagle project is situated in mining-friendly Yukon with good infrastructure and evident approval from the Government and Na-Cho Nyak Dun. With all the construction, mining, and water permits in place it’s full steam ahead on the $400M financing front either through debt, equity, joint venture, royalty/stream, or a combination of the aforementioned. 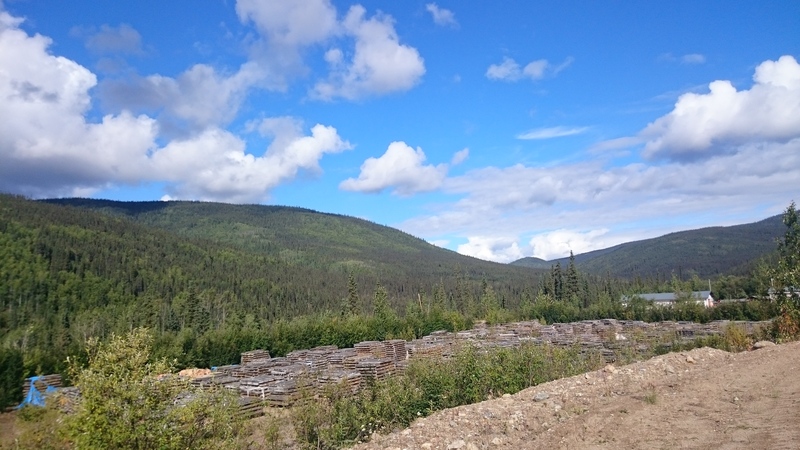 Like all the other Yukon gold projects we’ve discussed Victoria is highly leveraged to the gold price which will cause movement in the share price. 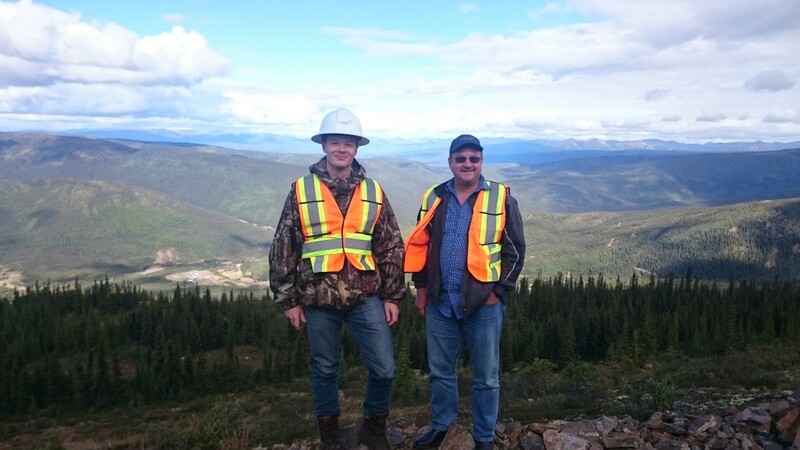 John Mcconnell, P.Eng, CEO & President and myself atop the Eagle Gold Project. Victoria Gold camp is to the left on the valley floor. Thank you all for reading the Yukon Mining Investor Guide. I hope throughout the 8 part series you learned about some new projects and enjoyed the update on the companies you already follow. It’s been an incredible journey for me, visiting so many promising projects. I would once again like to extend my thanks to Corey Kanzig, Senior Business Dev. Advisor, Government of Yukon and Anne Lewis, Executive Director, Yukon Mining Alliance for making this all possible. For any readers just joining in now, see here for previous parts: Part 1, ATC, AXR, WG, KAM, RK, WRN. I fell in love with the Yukon and already I am planning for my return. To that end, I have entered into a contest to win round trip airfare to Whitehorse, and I need your help. CEO.ca readers, if you have enjoyed my Yukon Mining Investor Guide series please take 5 seconds to like my video here: https://www.facebook.com/OurYukon?pnref=story. 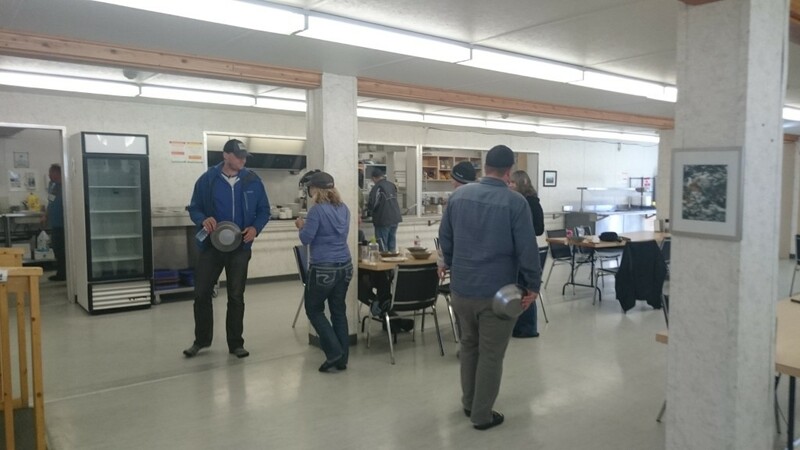 If I get the most ‘likes’, there will be more site visits and reports on your favorite Yukon projects. DISCLAIMER: The work included in this publication is based on SEDAR filings, current events, interviews, and corporate press releases. It may contain errors, and you shouldn’t make any investment decision based solely on what you read here. This publication contains forward-looking statements, including but not limited to comments regarding predictions and projections. Forward-looking statements address future events and conditions and therefore involve inherent risks and uncertainties. Actual results may differ materially from those currently anticipated in such statements. The views expressed in this publication and on the CEO.CA website do not necessarily reflect the views of Pacific Website Company Inc. or the author. The author holds no shares in Victoria Gold and has received no compensation for this article. This publication is provided for informational and entertainment purposes only and is not a recommendation to buy or sell any security. Always thoroughly do your own due diligence and talk to a licensed investment adviser prior to making any investment decisions. 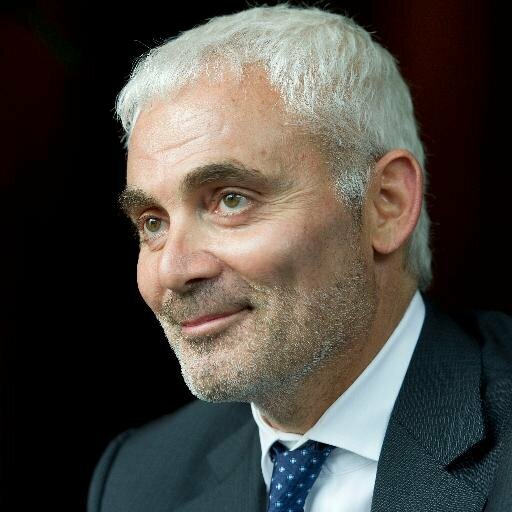 Resource companies such as Victoria Gold can easily lose 100% of their value so read Victoria’s profile on www.SEDAR.com for important risk disclosures. It’s your money and your responsibility. Using financial numbers several times in the article…where is the CAD$ or US$. Easier for the reader to translate numbers to real time gold price, etc.